When in Phoenix visiting family, the ladies sometimes go for tea (while the guys find a craft brew pub). 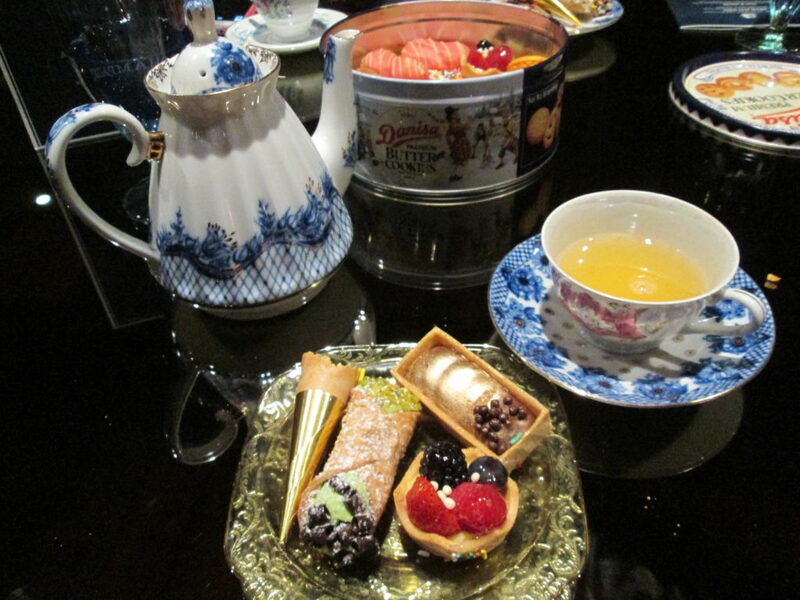 With the 2017 opening of the Tipsy Tea at the Camby, we had to go there. 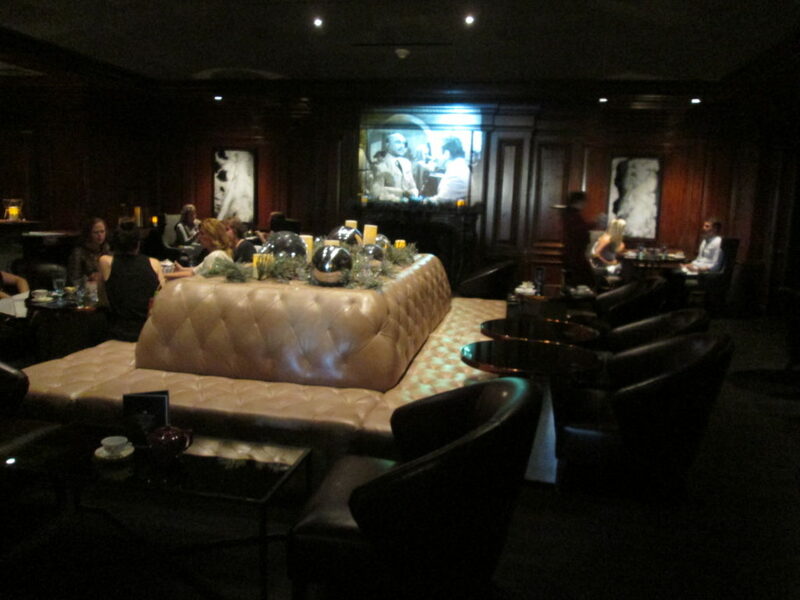 The tea is in the Bees Knees, a dark paneled classic bar with mirrored walls and banquettes. Casablanca was silently playing on the wall above the fireplace. The tea menu takes some time to peruse, as the cocktails aren't what you're used to. You can choose from cold or hot infused alcoholic teas, single serving sparkling wine cocktails, champagne by the bottle, or nonalcoholic drinks. 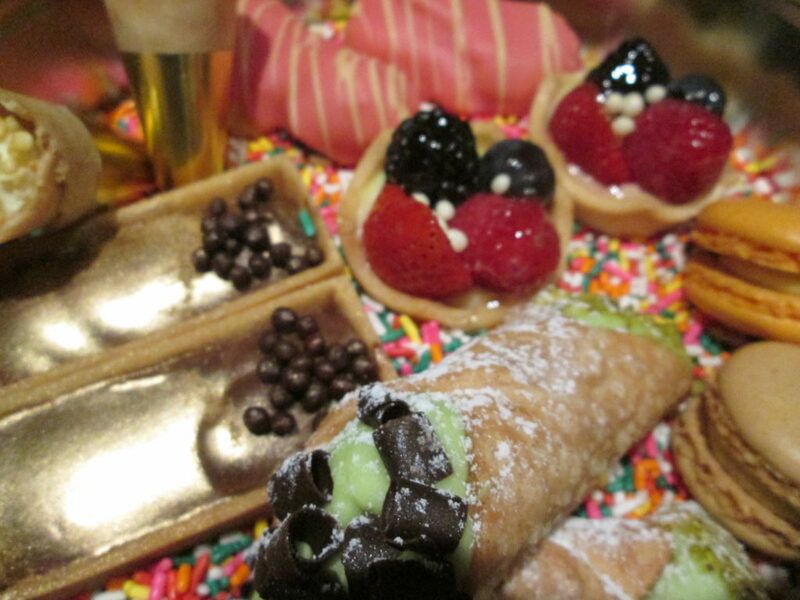 While there's a menu of treats, you get one of each (though they'll substitute for you at no cost. We had a strict vegetarian in our group, and none of us eat pork). It's a little weird to be in such darkness in the middle of the day in Phoenix, a city always filled with sunshine. That said, the Bees Knees bar was lovely and the setting quite different from our light-filled flowery teas in the past. 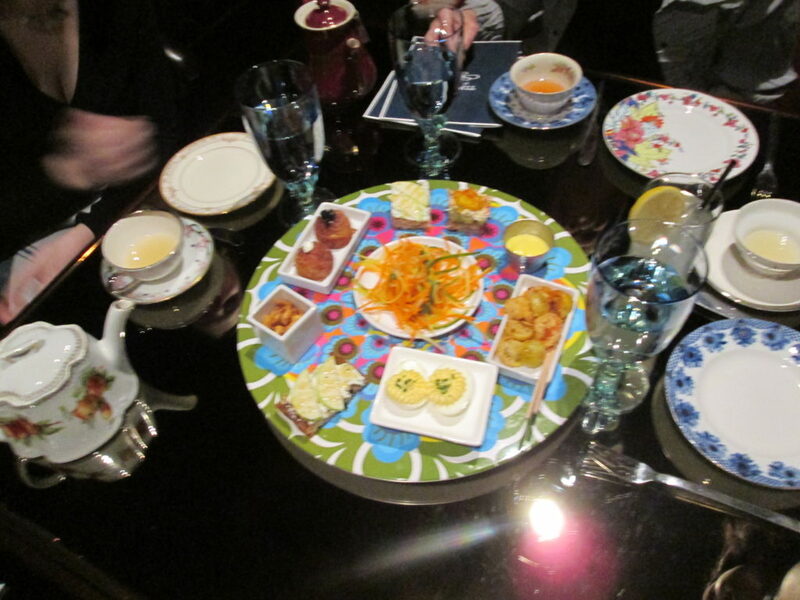 The food is presented on a lazy Susan that looks like it could be designed by Jonathan Adler, with a 60s type design. 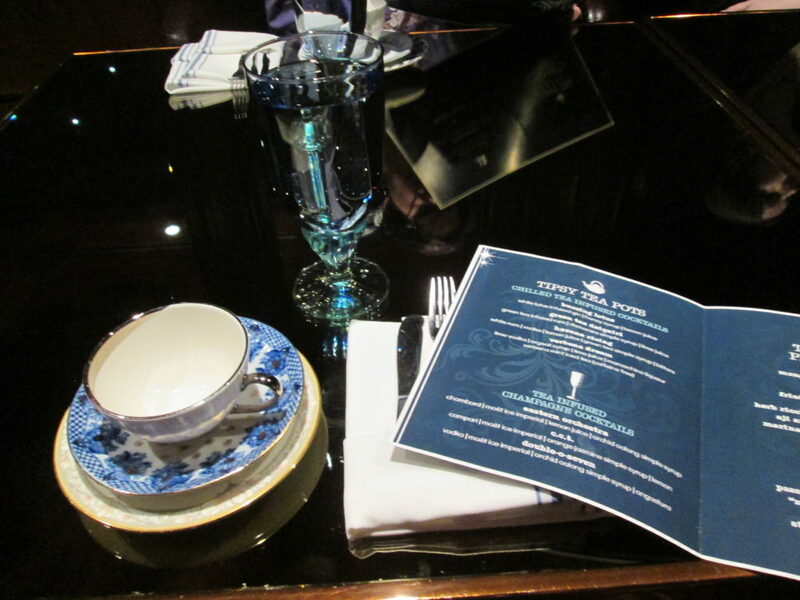 The place settings were mismatched china (we had to return two teacups that came with their own lipstick marks already on them). -truffle deviled egg with potato chip dust (probably my favorite). With three adults imbibing, we split two pots of hot tea and one cold. Each pot holds 2-2.5 cocktails. Our favorites were the cold (Verbena dream, with lime vodka, orgeat syrup, lime juice and verbena mint ice tea) and the hot Slow and Steady (Grand Marnier, china china, lemon juice, brown sugar simple syrup and chamomile citron). We also had the Spiced Pear Toddy (bourbon, lemon juice, demerara simple syrup, spiced pear liquor and earl grey), which we wouldn't order again. A little too strong on the bourbon for our taste. The other drink options looked great too, and I would probably still stick with the alcoholic-tea for the novelty factor (and they were good). Plus you get a pot of it. If you order a champagne cocktail, you just get one glass included. My niece ordered a lemonade which she loved, and my daughter got a mocktail they created for her. Don't forget to walk around the hotel when you're done. They have some funky art and a fun hands-on installation in the lobby. Cost: The tea was $40 a person, whether or not you order an alcoholic drink. 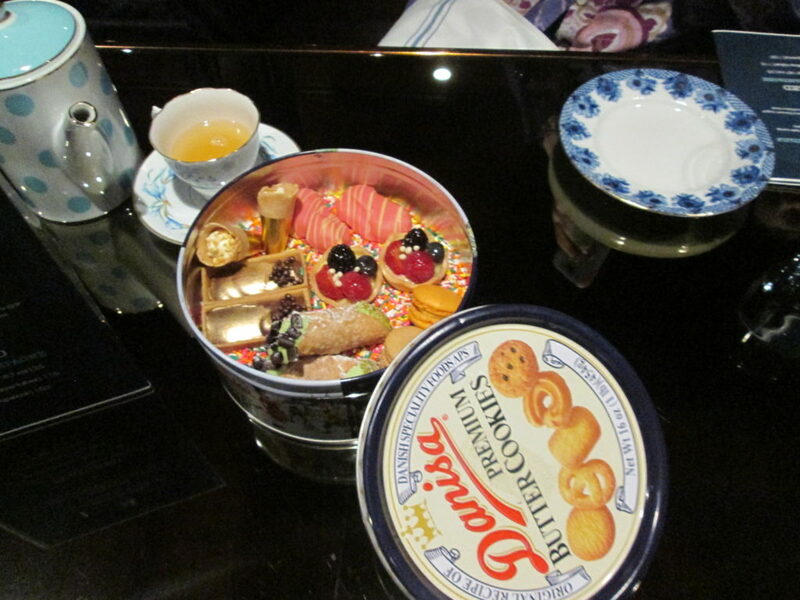 The bill comes in a tea tin - very cute! When: every Friday and Saturday, from 2-5 p.m. at the Bees Knees bar. Reservations recommended, but you may be able to walk in as well.